17. Books. Now that I don’t have to write book reports and memorize facts for tests anymore, I can actually enjoy reading. At least, until I forget what I read two days later. What am I reading now, you ask? Good question. Let’s see, Atomic Habits, by James Clear and….I forget the name of it…. (checks Kindle…what does the cover look like…..stupid short-term memory)….A World Undone: The Story of the Great War, 1914-1918, by G.J. Meyer. Light reading. 16. GIFs. Not sure I would be able to properly communicate without them. If I could do public speaking in all GIFs, I would. Can never get enough Beaker. 15. The 2018 Boston Red Sox. As a die-hard Red Sox fan, it was a rough last few years, from last-place finishes to first-round playoff exits. This year was special from the get-go and the team brought me so much joy. Extra points for Mitch Moreland dunking Alex Cora in the beer cooler during the celebration. 14. Writing and speaking. Sharing my story with audiences on the internet and in person has provided me great satisfaction. I have connected with so many people from around the world I otherwise would have never have met. 13. Autocorrect. Considering I have next to zero dexterity left in my hands, autocorrect is a godsend. At least, when it works the way you want it to. When it doesn’t, it is the literal worst*. 12. Space heaters. I am always cold. Especially my feet. 11. Microsoft Excel. My life is basically one big spreadsheet with numerous tabs. Am I a nerd? Is this even a question? 10. Home office technology. If I had to go to an office every day to work, I wouldn’t be employed full-time, that simple. Whoever invented videoconferencing, you deserve a high-five. 9. Socks with rubber grips on the bottom. I wear grip socks every day now that my balance is terrible. Even something as simple as socks with traction on the bottom can make a big difference for me, even if they are a bit thin and contribute to my constant cold feet. 8. My power wheelchair. I just ordered it a couple weeks ago. I am actually looking forward to the freedom it will provide. I’m also stoked to have a seat lift that will allow me to have conversations at eye level. 7. Boston. Although I am bummed out that I haven’t lived in the Boston area since 2016, missing the city motivates me to get my ducks in a row and come up with a plan for moving back. 6. My job. 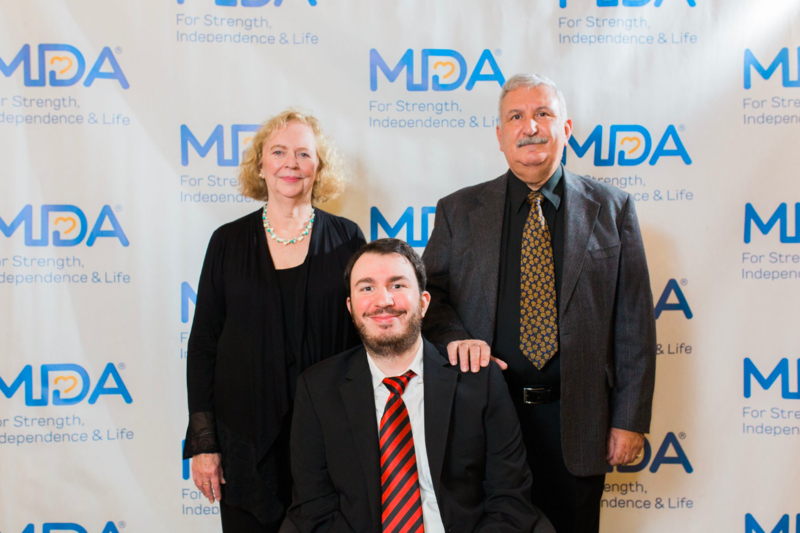 Speaking of work, I am very happy for my job at the Muscular Dystrophy Association. This time last year I was a bundle of stress at my previous job. I was miserable and not sleeping well. I knew I had to quit when all I could think about at the Thanksgiving table was checking my email, afraid that there was something that needed my immediate attention. Quitting was a big risk – I was really sad for a few weeks and afraid that I’d never find another job again. A year later, it couldn’t have worked out better. 5. Role models. From my fellow muscle disease patients to everyday people who have overcome adversity, their examples have meant the world to me. 4. My friends. I have a wonderful support system of friends I’ve made over the years. From picking me up off the sidewalk to driving me to class, they have been with me through thick and thin. 3. My niece and nephew. All of the love, none of the responsibility! And yes, ok, my sister also. I love you too, Jen…. (dodges box of Kleenex). My dad put it best – we’ve spent more time together in the past two years than in the previous 20. Sure, I’d love to be back on my own again in Boston, but having this extra time with my parents isn’t a bad consolation. Love you guys! 1. God. People often ask me how I’ve been able to deal with my circumstances. The truth is, in the beginning, I didn’t handle it well. Many a night I lied in bed, restless, asking why. It was a struggle to get up every day. Yet, it was my faith that ultimately got me through it. Faith that all of this would work out in the end. That my suffering had a purpose. It took a while, but I can finally see, based on where I’ve come from and the road ahead, why I was dealt this hand. I’m sure as soon as I publish this I’ll remember something I should have added to the list. Oh well. *While we’re on the topic of things I hate, here’s a quick list of what I am not grateful for this Thanksgiving: autocorrect when it goes haywire, people who say “the literal worst”, elusive back itches, stuffing (yes I hate stuffing, sue me), sleep paralysis, spiders, robocalls, accidentally yanking my earbuds out of my ears, marshmallows, the guilt I feel when I forget to floss, running out of data, driving into New York City, people who say “I can’t even”, watching a channel that’s not in HD, awful hold music, Red Sox fans 14 and younger who think all the Red Sox do is win the World Series, the Carolina Hurricanes, and stairs. I really, really hate stairs. Very pleased to see that gifs and Excel made the thankful list. More pleased to see that stairs made the hate list. Happy Thanksgiving (even though real Thanksgiving was at the beginning of October). Nice to see your top two would be the same as mine. The support of my family and my strong belief in God has helped me overcome setbacks and hurdles throughout my life.